Worldly Elegance: An important example of 18th-century American architecture, Gunston Hall represented the Gothic, French Modern, Chinese, Palladian, and Classical styles in its interior. Estate of the Nation: George Mason’s Georgian-style home sits atop a bluff overlooking the Potomac. His writings significantly influenced 18th-century political thought. Time Capsule: At Montpelier, the 18th century comes alive with guided tours and archaeological digs. Artifacts have been found at Montpelier including Madison’s namesake seal. Grand Design: Architects Charles-Louis Clérisseau and Thomas Jefferson modeled the Virginia State Capitol after the Maison Carrée, a Roman temple in Nîmes, France. Hallowed Ground: The Emancipation Oak, where the famous proclamation was first read aloud in the South, is designated as one of the 10 Great Trees of the World by National Geographic Society. Virginia’s Tidewater and Piedmont regions showcase the legacy of European exploration and colonization stretching back more than five centuries, and indigenous occupation for countless more before that. Then there are the complexities of slavery, the Civil War, and the civil rights movement, with all this human drama set against a lovely backdrop of mountains, fields, rivers, and seacoast. Despite Virginia’s wide-open spaces, the most popular history destinations—Mount Vernon, Monticello, and Colonial Williamsburg—can be terribly crowded. And it’s hard to appreciate the mood of late-1700s’ society while packed into a room with dozens of other 21st-century visitors. In contrast, the roads less traveled in Virginia offer superb alternatives: George Mason’s Gunston Hall, James Madison’s Montpelier estate, the magnificent Virginia State Capitol, and rural Appomattox Court House, where the Civil War finally came to an end. And for moving encounters with African-American history, head to Hampton Roads, the watery wonderland where the state’s main rivers finally meet the Atlantic Ocean at the mouth of the Chesapeake Bay—to the Emancipation Oak, Fort Monroe National Monument, and the Mariners’ Museum and Park. There’s always more to discover, of course, but here’s a collection that’s sure to satisfy any history lover’s yen for meaningful learning. Each one alone makes a fine stop on the way to somewhere else. Or try stringing two or three destinations together over a few days of touring. Sumptuous! That’s Gunston Hall, the masterful home of George Mason, whose phrase in the May 1776 draft of the Virginia Declaration of Rights, “That all men are by nature equally free and independent, and have certain inherent rights,” resonated in our national Declaration of Independence two months later. Mason and George Washington were neighboring plantation owners on the Potomac River—six miles as the bald eagle flies, about 12 miles by car today. Of Mason’s original 5,500 acres, a tenth remains intact. Not especially large or grand on the outside, Gunston Hall, completed in 1759, displays the highest decorative arts of the Colonial era within its public rooms: color-saturated walls, ornately carved architectural accents, and opulent fabrics. Mason had a large family, accommodated simply in a succession of plain bedrooms upstairs. The icing on this cake is Mason’s extensive and carefully planned landscape (Mason and Washington even shared fruit tree grafts). Surviving today are an allée of 250-year-old boxwoods and some half-wooded, half-open views to the Potomac. A family cemetery in the woods is worth the short walk. As with many of Virginia’s lesser-known estates, you may have the place to yourself, especially mid-week and in the off season. A 25-mile drive northeast of Charlottesville sits James Madison’s Montpelier, where researchers have peeled back layers of time—and added-on “modern” architecture—to reveal the fine bones of this mid 18th-century estate. Home to the Father of the Constitution and the fourth President of the United States, Montpelier’s main house also served as a salon where America’s early luminaries could meet and discuss the important ideas of the day. There’s an extensive trail system, with both the family cemetery and the slave cemetery on-site—a stark contrast. The formal garden is a treat. Thomas Jefferson designed not only Monticello and the University of Virginia campus but also the Virginia State Capitol, a handsome white building in the heart of Richmond. An early 21st-century restoration has enhanced the visitor experience by channeling crowds of Virginia schoolchildren through a spacious street-level entrance, up into the hilltop capitol itself. The amenities are top notch, with exhibits and casual dining, a rarity at state capitols. 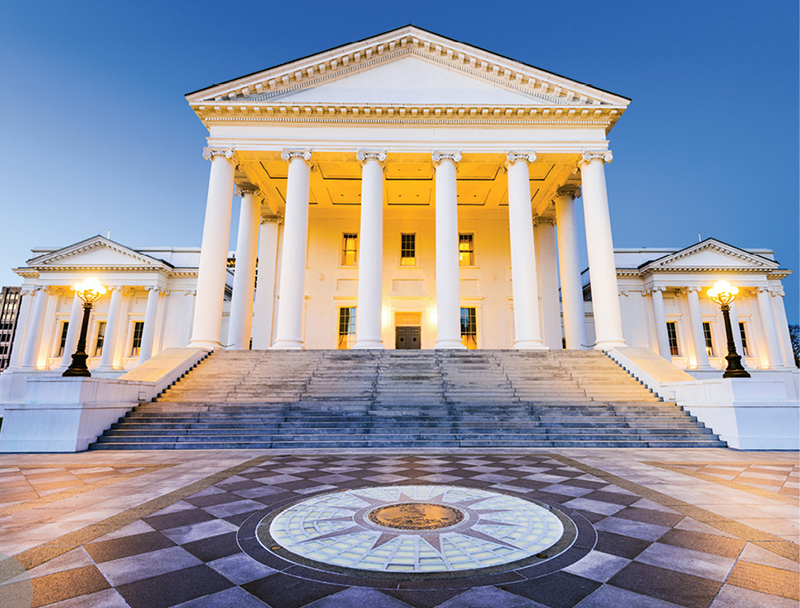 The original sunlit rotunda and capitol chambers, first used by the Virginia General Assembly in 1788, glisten like the finest art galleries of the world. Filled with contemporary statuary of the Founding Fathers and Virginia’s Civil War leaders, the capitol serves as a temple of democracy. The tour guides are scholars of Virginia history, and there’s so much to learn here that one visit may not be enough. In the spring of 1865, the guns fell silent. After four years of bloodshed and heartache, the Civil War was over. A key Confederate surrender took place on April 9 in the parlor of a simple brick house, now part of Appomattox Court House National Historical Park, where generals Grant and Lee quietly negotiated the terms. The self-guided nature of this 1,700-acre park includes not just the McLean house where the surrender was signed, but battlefields and a cemetery. Be sure to stop at the visitor center first to pick up a map. To appreciate the gentle countryside surrounding this important historic site, visit the 20,000-acre Appomattox-Buckingham State Forest nearby. This park is made for all sorts of outdoor recreation, with a focus on forest management; there’s even a driving tour of forestry as well as a lake and miles of hiking and other trails. Virginia’s history includes a long saga from African enslavement to American citizenship marked by struggle, resistance, and tempered triumph. Fortunately, there are some awe-inspiring places where visitors can stand and feel the tides of time. The geographically complex Tidewater peninsula, which takes in Norfolk, Newport News, and Hampton, includes several of the best sites. Stand beneath the massive, still-living Emancipation Oak on the campus of Hampton University, where the Emancipation Proclamation was first read aloud in the South. Better yet, touch the trunk at this quiet yet important spot. Not far away looms Fort Monroe, one of the most recent National Monuments. The fort, nicknamed “Freedom’s Fortress,” remained a Union installation even during the Civil War, and its walls sheltered enslaved people escaping Confederate territory. Eleven U.S. presidents have visited this breezy spit of land, from Andrew Jackson to Franklin Roosevelt. Finally, the Mariners’ Museum and Park in Newport News presents Tidewater Virginia’s long maritime history, with well-preserved artifacts and fine depictions of life before roads linked together the state’s far-flung settlements, including African-American communities in the Chesapeake Bay.